JAKARTA (Reuters) - An Indonesian court has jailed three leaders of a group that Islamic clerics had called a deviant religious organization for up to five years for blasphemy, sparking condemnation from human rights groups over the targeting of minorities. The now disbanded Gafatar hit the headlines after dozens of people, who had been reported missing by relatives, were believed to have joined. Last year, hundreds of members had to be evacuated from their West Kalimantan base after being attacked by residents who opposed their beliefs. Gafatar was labelled by Indonesia's Ulema Council a deviant sect and authorities had described its teachings as "dangerous". People associated with the group say it is a social organization, not religious. 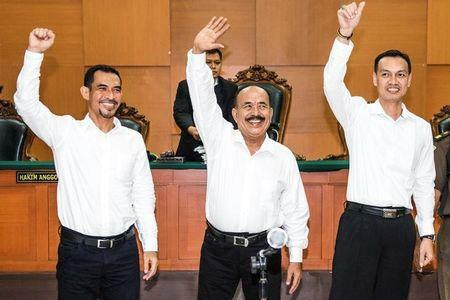 A panel of judges at the East Jakarta court on Tuesday jailed Mahful Muis Tumanurung and Ahmad Mussadeq for five years and Andry Cahya for three years for blasphemy. The men were cleared of treason charges. A lawyer for the men, Yudhistira, described it as a "malicious prosecution" that had tainted Indonesia's justice system and said would consider whether to appeal. Indonesia's blasphemy laws have come under greater scrutiny since Basuki Tjahaja Purnama, Jakarta's Christian governor, was put on trial for allegedly insulting the Koran. He has denied wrongdoing but his trial has inflamed religious tensions. Almost all blasphemy cases in recent years have ended in conviction. Indonesia has the world's largest population of Muslims, the majority of whom adhere to moderate Sunni beliefs, and it recognizes six religions including Hinduism, Catholicism and Buddhism, but minorities, even within Islam, have faced rising intolerance in recent years. Human rights organisations criticised the verdicts.